The words alien and immigrant are used in the context of non-native residents of a country. There are some subtle differences between these words. An alien is a person from a foreign country who is not a citizen of the host country. They may be there to visit or just stay for a while. An immigrant is someone from a foreign country who relocates to live in another country. They may or may not be citizens. Aliens are subject to host country laws pertaining to non-citizens. Legal Non-resident aliens require Visas or Work Permits. Resident Aliens require documentation. Aliens without documentation are in the host country illegally. Immigrants are subject to the laws of their adopted country. They may only come if they have work or a place to live. An alien is someone who is a citizen of a foreign country. An alien is subject to host country laws regarding non-citizens (travel, employment, education, and residence). These laws require registration and documentation defining their status while they are in the host country. A registered alien may be a temporary or permanent resident. In the United States, aliens are granted two types of visas: non-immigrant or immigrant (permanent resident). Aliens may or may not have the right to work in the country, and may be legally allowed to live in the country for varying durations. Regardless of these restrictions and rights, an alien is not a citizen of the country. Therefore she does not have the rights that citizenship confers such as the right to vote, nor the responsibilities of citizenship, such as being subject to conscription (military draft). An immigrant in a country is someone who has relocated there from another country. An immigrant may or may not be an alien. If the immigrant has applied for and received citizenship, then they are no longer an alien. Since the definition of immigration relates to the country of origin and the country of resettlement, the person would be considered an immigrant throughout their life because they relocated to a new country from their country of origin. However, as soon as the immigrant receives citizenship, they are not an alien any more. 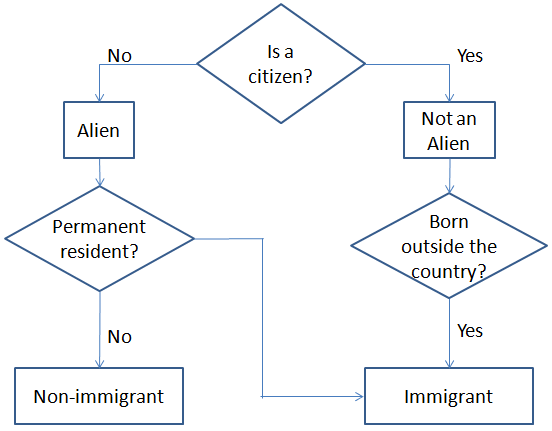 Use this simple flowchart to decide if a person is an alien or immigrant or both.